I don't enter blog giveaways very often any more, I just lack the time. But the week before Christmas I had caught up on my work and spent a good amount of time entering some pretty cool giveaways. My friend Sheri over at Kidsumers was hosting a giveaway for a 3 night stay at a Global Resort Homes location in/near Orlando, Florida. I entered it thinking it would be pretty darn cool if I won, but not expecting too because it was a pretty awesome giveaway and I never win much of anything. You can imagine my surprise when she emailed me to tell me that I won! 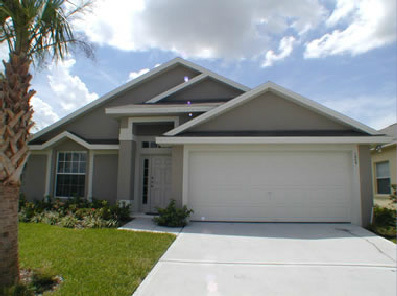 Global Resort Homes is the place for Orlando vacation home rentals; with nine resort communities all conveniently located near Walt Disney World, SeaWorld and Universal Studios. We are not sure which resort we will be staying at yet, but just from looking at their gallery of photos, I can see that they are all gorgeous. 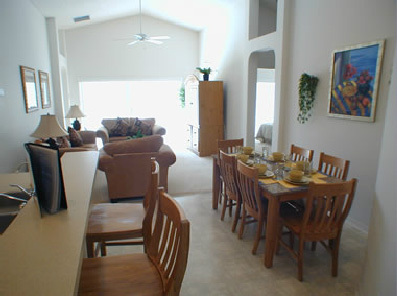 Shown above and below is a home in their Glenbrook Resort. Some amenities that you might find at a home in Glenbrook are a private screened swimming pool and spa, a fully equipped kitchen and a washer and dryer. And that is only the beginning. These homes are seriously way nicer than my actual home, I may never want to come back! Once I found out that I won I immediately began figuring out how we could plan our Disney vacation. I have only been to Disney twice: once when I was 3ish and again back in 2011 - where my husband proposed to me. We have been discussing taking our boys down there the past few years, but it just wasn't in the cards for us. But there is no way we are going to passing up this awesome opportunity! So now I am frantically trying to put everything together, which is only slightly overwhelming. I look forward to sharing our Journey to Disney with you along with my own Global Resort Homes review, so be sure to check back. For those of you that have traveled to Disney with your family, I would love any tips on how to plan without losing my mind. Were there any tools or websites that helped you? Plus what are some things things we must do or see while we are at Disney? I won a 3 night stay at Global Resort Homes plus will be receiving 3 additional nights to review. All thoughts and opinions are 100% my own. This is by far the best news I've heard in a very long! Can't wait to see you. You'll love Global! Give Tara a big hug from me. Enjoy your trip and congrats!! I'll give you more tips soon. That is so awesome! I love your new look (every time I pop over I love it anew) and your site loads so fast, it's a pleasure to visit here and read. This is so exciting! I am very excited that you are going to Disney. I am patiently waiting for either this coming Summer or the following year to plan a trip for my family to go there. Woohoo! I can't wait to take my kids one day! You guys have a blast!! How fun! I can't wait to take my kids!! That's so exciting! No tips since I've only been to Disneyland just very recently but I guess I'd say wear comfortable shoes, lol! I'm so helpful eh?